Hatten Land Limited, Samsung C&T Corporation and Polin Waterparks, to build a RM200 million water theme park, the largest in Melaka. 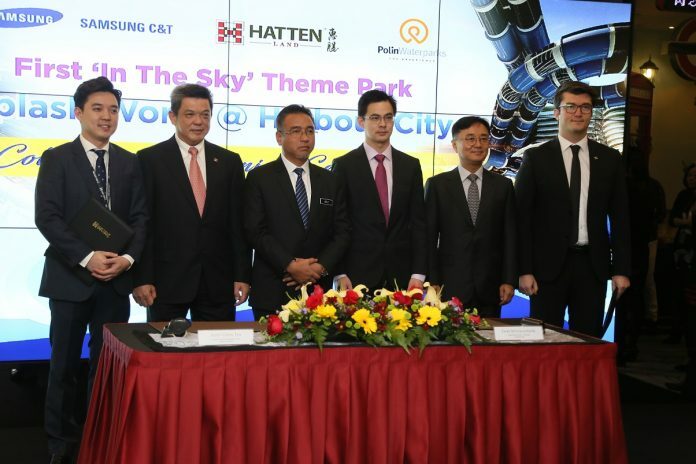 The world’s first sky theme park is intended to be catalyst for the Malaysian historical city’s tourism industry. Splash World @ Harbour City, a 500,000-sq ft water park is to be located 14 floors above the ground in the centre of the designated UNESCO World Heritage city, which hosts nearly 17 million visitors a year. Expected to be opened to the public in the first half of 2020, Splash World @ Harbour City will be one of the region’s largest water parks with up to 5,200 visitors a day. It hopes to attract 850,000 to 1.0 million visitors annually after the first year of operation. With an estimated development cost of RM200 million, Hatten Land will develop the project. Samsung C&T Corporation of South Korea will be operation advisor and consultant, while Polin Waterparks, headquartered in Turkey, will design and manufacture the water slide attractions. Nestled between two 30-storey towers on the 14th floor deck of Harbour City @ Melaka, a mixed development shaped like a large ship, the four-storey Splash World @ Harbour City is the first in the sky theme park that will offer an indoor and outdoor waterpark experience with more than one kilometer of water slides. Dato’ Colin Tan, Executive Chairman and Managing Director of Hatten Land says, “Splash World @ Harbour City is a hugely important project which underscores Hatten Land’s commitment to the long-term development of Melaka. We are partnering world-renowned leaders in their respective fields – Samsung C&T Corporation and Polin Waterparks – to place Melaka on the world map as a must-visit destination. We are grateful to the Government of Melaka and the Malaysian authorities for their support of this project. “Splash World @ Harbour City is an exciting new destination for Malaysia and one of the region’s few major waterparks. Polin Waterparks is honoured to be appointed to design and install Hatten’s choice of hybrid ride designs to create a one-of-a-kind experience for Splash World’s guests,” adds Emre Büyükgüngör, Regional Sales Director of Polin Waterparks. Polin Waterparks is a multi-award-winning global leader in the design, production, engineering and installation of waterparks and water slides that incorporate efficient smart design features. With a track record of 3,000 waterpark projects in 105 countries, it is the largest water slide supplier to waterparks in Eurasia.